The route is quite easy due to low differences in height even if on unasphalted roads. Some walks are quite long but can be shortened if requested in advance. The whole itinerary is well marked by the Official signs of the Via Francigena (white red markings and yellow sign with the Pilgrim symbol on it). The route from Montefiascone is along a plain that divides the Bolsena Lake from the Cimini Mountains. The outline of the hills is sometimes mild and allow wide sights on the whole territory. There are no residential areas along the route, but there are some old drinking fountains. Arrive in Viterbo and take some time to visit the lovely old town. Dinner on your own in one of the restaurants in town. On the first part of today's itinerary you will be exploring the Etruscan hollow roads then you will immerse in the typical Etruscan countryside. There are no villages along the way to Vetralla. Dinner is included at the accommodation tonight. Today the route is quite long. From Vetralla you walk along the volcano side, which crater was occupied by the Lake Vico in the past. Continue the itinerary across the Etruscan countryside until you reach the tiny village of Capranica. From here you walk down to a tuff gorge by following the stream. The track is very striking but sometimes it could be difficult because of the water flow. Finally arrive at you accommodation in Sutri where you can enjoy a nice dinner. The first section of the route moves across fields till Monterosi till you reach the Monte Gelatowaterfalls, a park where you can rest and have a bath. Then you walk along a panoramic excavated street leading to Campagnano doors. To shorten the day’s walk it is possible to pre-arrange a morning transfer to the picturesque village of Monterosi, from where you walk to Campagnano di Roma. The day’s excursion is along the Roman countryside. The itinerary is quite flat with dirt roads or country trails, with just some hill in the final part. You will need to cross a stream and this could be more difficult just in particular conditions of water flow. After breakfast, you set off for the last leg of your modern day 'pilgrimage' along the Via Francigena to Rome - the 'Eternal City'. You can choose to reach Rome by public transportation or walk your way to Rome. Part of the walk to the city is through the Insugherata park, a beautiful natural reserve a few steps away from the bustling city. As you approach the eternal city you can stop for a triumphant photograph at the Monte Mario Belvedere. From here you are able to see a glimpse of the dome of Saint Peter's, before descending towards the city to finally reach Piazza San Pietro, your ending point and that of many pilgrims throughout the centuries. You will be immediately fascinated by the magnificent history, monuments and archaeological areas of Rome. Discover the city's amazing restaurants and traditional cuisine. If you want to maximise your time in Rome it is possible to skip most of today's walk by taking a local bus and train. The trip and our services end after breakfast unless you have pre-book an extra in night in Rome or other destinations in Italy. Hotel Urbano V is situated in a very tranquil position, in perfect balance with the architecture of the historical center. Rooms are well-finished, clean and comfortable. These offer TV satellite, Safe, Air conditioning, free Wi-Fi. Breakfast is rich and good. Hotel Riario is in the center of Medieval Viterbo, in a building of the 16th century. Rooms are furnished in elegant way, comfortable and well-finished. These offer TV, free Wi-Fi, air conditioning. Breakfast is good and rich. The Antica Locanda *** is immersed in the Tuscia Viterbese countryside, surrounded by expanses of olive groves. It offers well-kept, clean and rustic-style rooms. Comfort: free Wi-Fi with uneven coverage in all rooms, air conditioning, TV, telephone. It also has mini-apartments equipped with a kitchenette and whirlpool. Very good breakfast with genuine products and quality. The Montefosco Farmhouse is immersed in the green of the Lazio countryside, surrounded by an expanse of hazels. The rooms are well kept, clean and well furnished, equipped with every comfort: free Wi-Fi, TV, air conditioning / heating. The cuisine is of quality and the restaurant offers traditional products prepared with local ingredients. Friendly and helpful staff. Hotel Ristorante Benigni is in central Campagnano Di Roma surrounded by Veio's Park and by volcanic complex of Monti Sabatini. Rooms are simple and basic with private bathroom, air conditioning, TV, telephone and free Wi-Fi. Restaurant is very esteemed. Average breakfast. This Hotel is sets in the medieval village of Isola Farnese and it has a quiet and relaxing location. Rooms are furnished in a simple way, but these are spacious and comfortable with free Wi-Fi, air conditioning. Staff is welcoming and helpful. Breakfast is normal. The rooms of Domus Sessoriana are obtained from the cells of the monastery attached to the Basilica of the Holy Cross in Jerusalem. These are spacious, basic and clean. They have these comforts: air conditioning, satellite TV and free Wi-Fi in common areas. Staff is courteous and helpful. Italian breakfast is served on the terrace. The closest airports to Orvieto are Perugia Sant'Egidio (PEG), Florence Amerigo Vespucci (FLR), Rome Fiumicino (FCO) and Rome Ciampino (CIA). From any of the airports indicated (PEG, FLR, CIA, FCO), you can reach the central train station by public transport, and then take a train to Montefiascone (just few trains are direct). 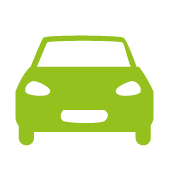 If you arrive by car, you can leave your car in one of the several pay and display unguarded parking areas in town. Luggage transfer DAY 2 to DAY 7. * Luggage transport limited to 1 piece per person. Supplement will apply if exceded. Luggage delivery is guaranteed at 4pm.